This is a super easy (and inexpensive!) DIY nail polish rack. This rack cost me under $20 to make and holds between 90-115 polish bottles, depending on the size of the bottle. I followed Nicole Guerriero's tutorial and it turned out pretty well! On your first piece of foam board draw a horizontal line every 5 inches. This will be your backboard. Set this piece aside for now. On your second piece of foam board measure and cut seven 2-inch horizontal strips and seven 1-inch strips. 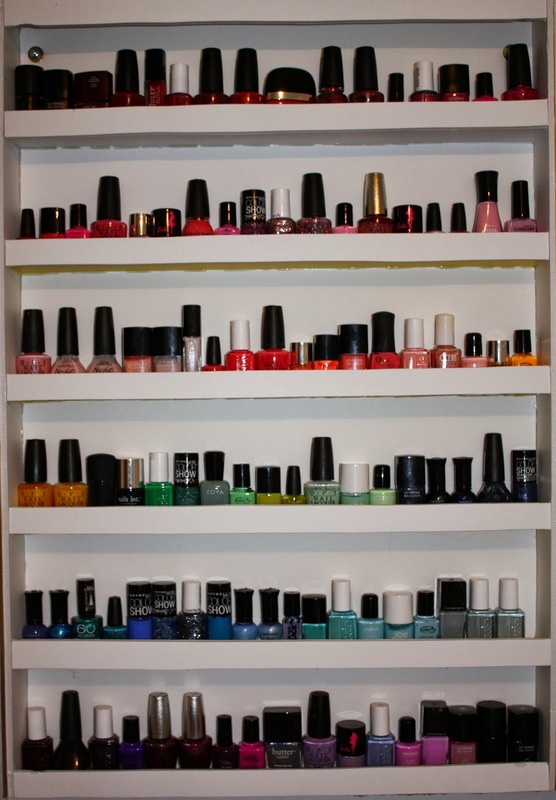 The 2-inch strips will be your shelves and the 1-inch strips will prevent your polishes from sliding off the shelves. On your third piece of foam board cut two 2.5-inch vertical strips. These will be your sides. Take the seven 2-inch strips and glue them along the lines you drew on your first foam board, making sure that the top and bottom strips are glued to the front of the foam board and not along the top/bottom (otherwise your side pieces will not be long enough). Take the two 2.5-inch strips and glue them to the sides of your rack, making sure to attach along the base and along each shelf. Work quickly! My glue tended to try fairly fast and lining a strip of glue along the edges and all the shelves before attaching was a slight challenge. Take your seven 1-inch strips and attach them to the front of your shelves. Make sure you are gluing the strip in front of, rather than on top of, the shelf, otherwise you will have an unsightly seem. To mount to the wall just insert a screw through each of the four corners (they should be fairly hidden thanks to the shelves). The fuller rack on the left holds about 105 polish bottles. Be careful when cutting your front strips or they can come out slightly wonky, but nothing you can't fix with your exacto knife. 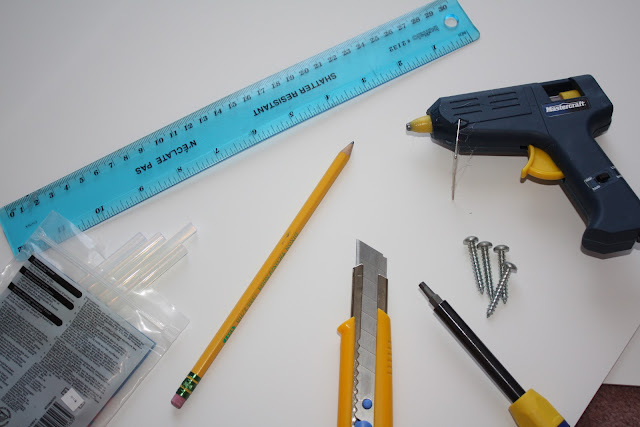 Make sure when you are gluing together your pieces that you glue in three different areas: once for direct contact, and then along both the top and bottom sides. This will ensure your shelves will be able to support the weight of the polish bottles. I purchased my foam boards from WalMart and they only carry this size of foam board (20"x30") in black or yellow/white. I used the yellow/white board and just placed everything with the white side facing out. I found the larger, heavy duty exacto knife to work better than the smaller, thinner ones. I purchased mine from the dollar store. If you are planning on making two racks, like I did, you only need five pieces of foam board instead of six because you don't fully use all of the foam board for the first rack. I currently have the polishes organized by color.